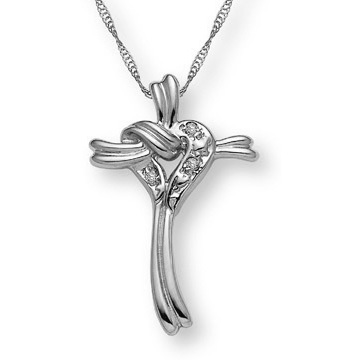 The cascading diamonds remind us of the glory of His resurrection, just as the heart and cross are wrapped together in dual lines to show God's love ever with us. Small, prong-set diamond accents sparkle radiantly from the heart. Cross measures approx. 1" tall x 5/8". 14k white gold chain, included in 18" (other sizes available by request). Also available in yellow gold (shown below). We guarantee our 14K White Gold Cross and Heart-Knot Diamond Necklace to be high quality, authentic jewelry, as described above.